Here is the circuit diagram of a simple two transistor alarm circuit that can be operated from a 9V PP3 battery. Here the two transistors are wired to form an oscillator whose frequency increases when switch S2 is pressed and decreases when S2 is released. In order to attain this the base of Q1 is biased from an RC circuit comprising of R2 and C1.When S2 is pressed C1 is charged through the resistor R2.As the voltage across the C1 increases the time constant decreases and this results in an increases in the frequency. When S2 is released capacitor discharges and the frequency of the tone decreases. The sound heard from the speaker will be almost like that of a siren. Switch S2 can be a miniature push button switch. The type no of transistors are not very significant here. Use BC148B for Q1 and BEL188 or S8550 for Q2. 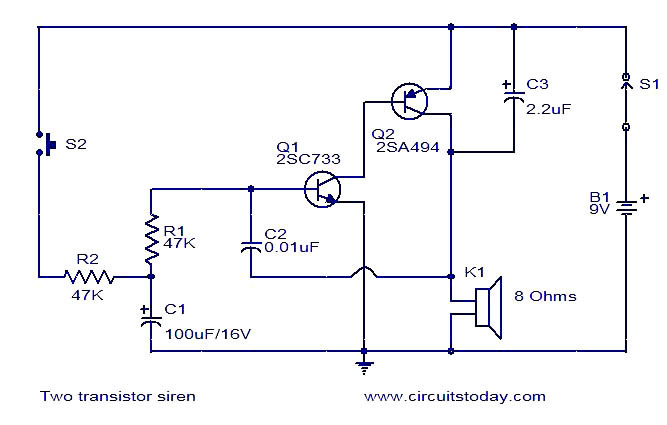 Hi Saurabh a siren is a source which will be raising in frequency for some time and then decreasing in frequency of sound for some time. You may please read the description of the siren, the operation is clearly given by the author. can u please give the detailed working of siren?? ?